Members of our union’s various Service Group Executive (SGE) committees met on Tuesday afternoon (10 January) at UNISON’s national headquarters in Euston Road to debate and vote on the ‘heads of agreement’ framework documents for the local government (LGPS) and NHS pension schemes. After a tense debate, the vote within the Local Government SGE was 24-to-10 in favour of accepting the existing framework agreement as the basis for further negotiation over the next three months with the aim of achieving a final settlement with the local authority employers and ultimately the Government. The margin was much narrower in the Higher Education SGE, many of whose members come under the LGPS, but it too endorsed the ‘heads of agreement’. This means that there will be no further official strike action by UNISON members across local government and the higher education in connection with the pensions dispute before this April at the very earliest. In London the regional local government committee did not meet in the run-up to the vote, so there was no mandate on SGE members, though ours was one of seven local government branches across the region that had argued clearly in favour of rejection and further industrial action in the near future in an email and telephone survey. Two of the three existing SGE members, Sonya Howard, Kensington & Chelsea branch, and John McLoughlin, Tower Hamlets branch, voted against the framework agreement, while the third Irene Stacey, who currently holds the reserved seat for low-paid members voted in favour. Elections for the three London seats on the executive will take place in the spring. (John will be seeking re-election, while Sonya is standing down from the SGE). In my view the decisions taken on Tuesday 10 January by the local government and higher education SGE committees mark a significant setback at a time when 10 other unions have refused to sign up to the ‘heads of agreement’ in various schemes and there is still the potential for further united action to build on the impressive 30 November strike and to win far more concessions. The situation in the NHS is somewhat different in that members of the Health SGE neither endorsed nor rejected the ‘heads of agreement’ for the NHS scheme, but instead reaffirmed that any final proposed settlement would go to a full membership ballot among affected UNISON members with the possibility of the Health SGE recommending either acceptance or rejection. Meanwhile, alongside dozens of other local government branches, Camden will be considering a motion calling for a special local government service group conference to advance a far wider debate about this crucial dispute. This Saturday (14 January) some branch officers will be attending an emergency meeting, convened by Unite the Resistance at Friends Meeting House, Euston Road, which includes PCS general secretary Mark Serwotka and NUT deputy general secretary Kevin Courtney among the platform speakers. I very much hope that the meeting will offer UNISON and other trade union activists determined to carry on the pensions fight the opportunity to discuss the way forward in the light of recent developments. Our branch committee, which the previous week had agreed by a unanimous (20-nil) vote to reject the ‘heads of agreement’ as the basis for resolving the pensions dispute, had also called a lobby of the service group executive meetings in the hope of encouraging a ‘no’ vote. 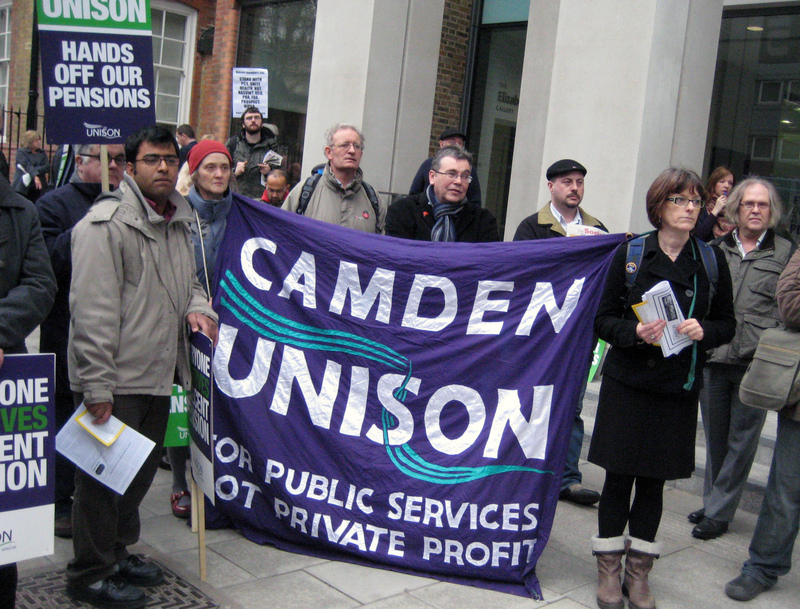 While there is little evidence to suggest it had the desired effect, the lobby did attract 100 or more at its peak, including 20 (+) Camden UNISON members to whom I wish to express my thanks for taking time out of their lunch breaks to take part at very short notice.